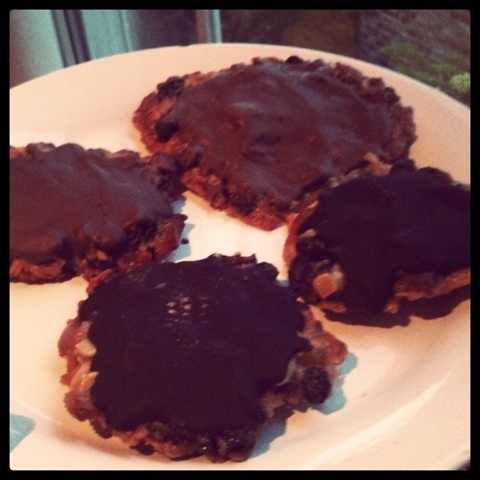 I am in christmas baking mood at the moment and these Florentines have been a hit with my work colleagues. Cheap, cheerful and yummy – they’re just what the doctor ordered on a cold, dreary December day! They are really easy to make and look impressive. The only problem when you make them, is trying to stop yourself from scoffing the lot before you give them away! Put the butter and golden syrup into a medium pan and melt gently. Remove from the heat and stir in all the prepared ingredients (not the chocolate). Put a tablespoonful of the mixture onto one of the prepared baking sheets and gently flatten it out to a round about 7cm in diameter. Repeat with the rest of the mixture to make 12 biscuits, spacing well apart to allow for spreading. Bake for about 8 minutes or until a good golden brown. Remove from the oven and leave to cool on the baking sheets for 5 minutes or until firm, then carefully transfer to a wire rack and leave to cool completely (the biscuits are very fragile so handle with care). To finish, put the chocolate into a heat proof bowl and set over a pan of steaming hot but not boiling water (don’t let the base of the bowl touch the water). Leave to melt gently then remove the bowl from the pan. Spread a thick layer of melted chocolate over the flat underside of each Florentine. If you like, use a serrated icing spatula or a fork to make a wavy pattern in the chocolate. Leave it to set, chocolate side up, on a sheet of non-stick baking paper. Store in an airtight container. I’ve been trying to decide what to take along to a party on Saturday and this is perfect – thank you! Guess what I’m doing today!